Sometimes I feel like I’m living in an alternate universe… it’s like the financial version of the ‘upside down’ from Stranger Things. Case in point: last night the infamously loss-making electric car maker Tesla announced its quarterly earnings. As usual, the numbers were gruesome. Tesla’s net loss was TWICE AS BAD as the previous quarter, a record NEGATIVE $717 million. That’s a LOT WORSE than analysts were expecting. After adjusting for various capital investments, Tesla’s total cash burn for the quarter was MINUS $740 million… which is a bit better than what analysts were expecting. Congratulations. Oh yeah, and Tesla cult leader CEO Elon Musk mustered an apology to all the analysts he insulted on the previous quarter’s earnings call (where he derided them for asking “boring” and “bonehead” questions). And now the stock has soared 12%. Is this really what capitalism has come to? Companies are richly rewarded for posting record losses that are worse than anyone expected because the grown men who pilot them can refrain from publicly hurling childish insults at financial analysts while managing to ‘only’ burn $740 million of shareholder capital? In total, Tesla has burned through $5 billion of its investors’ cash. And nearly half of the money it has left in the bank is in the form of customer deposits, which are often refundable. So that money’s not even safe. Most likely Tesla will have to raise billions of dollars over the next few years just to stay afloat. And yet, despite these losses, and despite the fact that their CEO is sidetracked making flamethrowers, limited-edition Tesla surfboards and promising to solve Flint, Michigan’s water crisis. . .
. . . and despite the fact that he seems more concerned with Twitter spats than running the business (the Wall Street Journal ranked Musk as the second-most active tech CEO on Twitter behind Salesforce.com’s Marc Benioff, with 1,256 tweets this year through mid-July) . . .
. . . shareholders still granted their CEO the largest executive compensation package in the history of the world earlier this year (worth a potential $50 billion). . .
. . . and have now doubled down on their investment, sending the stock price up 12%. No doubt Musk is full of both. Now, it may surprise you to hear me say that I appreciate what Musk has done for consumers. This guy gave a swift kick in the gonads to the entire auto industry, forcing them to reinvent themselves and create more innovative products. So now all the big manufacturers are getting in on driverless car technology, AI and electric vehicles. And the cars they produce are more advanced than ever before. This is great for consumers, and most of the credit goes to Elon Musk. I certainly hope the company is able to pull it off. I sincerely do. I also hope the Dallas Cowboys win the Super Bowl this year. But the odds are slim. The odds are also stacked heavily against Tesla. They’re rapidly running out of cash at a time when interest rates are rising and competition is stiffening. They’re no longer the only game in town when it comes to luxury electric vehicles, so they’ll have to contend with Mercedes, BMW, Audi, etc. going forward. And, let’s be honest, Tesla isn’t exactly the most prudently-managed company in the world. You can say a lot about Elon Musk’s vision and tenacity. But often the greatest visionaries don’t make the best business executives. Business is… well, serious business. Recruiting, training, managing thousands of employees and dealing with intricate details in a complex manufacturing business… these skills don’t always go hand-in-hand with creative genius. Clearly Elon Musk doesn’t work alone. But there’s been an alarming exodus of top executives who have departed Tesla over the past few years. But Musk is undeterred… he’s staying the course. It reminds me of something Barack Obama once said– “If you’re walking down the right path and you’re willing to keep walking, eventually you’ll make progress.” #DidIjustquoteObama?? Unless, of course, you’re on the wrong path. In which case you’ll eventually lose everything. Elon seems content to remain on his loss-making, cash-burning path. Regardless of the consequences, regardless of the feedback that the market is providing. But we’ll see. Anything’s possible. In light of such obvious risks, however, it still seems like a sign of pure lunacy. Tesla manufactures electric cars. BMW also manufactures electric cars. Tesla loses money on every sale and posts record losses. BMW is profitable. 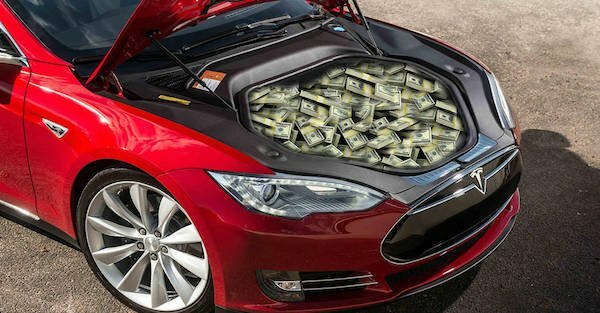 Tesla burns through billions in cash. BMW pays its shareholders a 5% dividend. Yet with a $50 billion market cap, Tesla is now worth exactly the same as BMW. But perhaps Elon can convince us otherwise on Twitter.